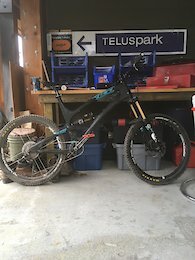 For Sale is my Yeti SB66c. 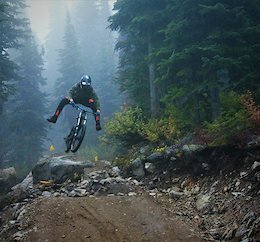 It's a great trail bike for long steep days, and can handle pretty much anything you can throw at it. 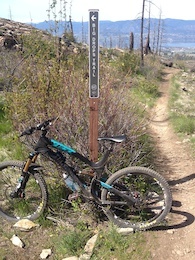 (except maybe 20 foot hucks to flat... this is not the bike for that.) Frame is in good condition. Some small scuffs and the sticker is showing wear. There's a slight chip on the chainstay, but it is very minor. Selling because I bought a DH and looking for a lighter duty trail bike. 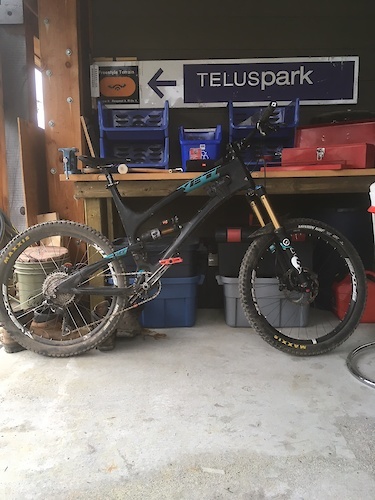 geometry can be found here: https://dirtmountainbike.com/gear/bike-reviews/yeti-sb66c-bike-test/ Specs: Fox 36 Talas - just serviced Fox Float Spank race 28 wheels, --> DHF front and rear, 8" rotors front and rear Formula r1s brakes, sintered pads Shimano 1x10 (32 up front, 11-42 in the back) 800mm no rise handlebars, Easton stem, Cane Creek headset DMR V10 pedals (I've been trying on flats for fun, they're pink.) No dropper. Race Face Post and SDG Saddle Located at Big White. Shout out to the kid in the NEBS 19 tee shirt. That's some local pride right there! Kelsey Serwa said hi to me. It was AWESOME.